Fine. Rubbing top edges and sun damages to edge of pages. No.1 BESTSELLERS-great prices, friendly customer service-usually dispatched within 24 hrs. Very Good. In the Freud Archives by Malcolm, Janet, 1986-04-10. 176 p. Flamingo S.. . Intended for professional and scholarly audience. Very Good. 0333644719. 1997 169pp. Very Good. Janet Malcolm's investigation into the personalities who clash over Freud's legacy endeavours to untangle the causes of their rivalry and soured friendships, while the flaws and mysteries of Freud's early work tower in the background. 224 p. Intended for college/higher education audience. Good. 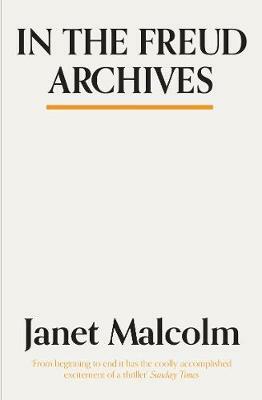 Janet Malcolm's investigation into the personalities who clash over Freud's legacy endeavours to untangle the causes of their rivalry and soured friendships, while the flaws and mysteries of Freud's early work tower in the background. 224 p. Intended for college/higher education audience. Very Good in Very Good jacket. -dustwrapper a little toned and shelfworn-previous owners blind embossed stamp to title page and small red circle to front free endpaper-Book ow/ solid, clean and bright 165 pages. 8vo. In Very Good Dustwrapper. Very Good. B-format paperback. 208 p. Intended for college/higher education audience. Intended for professional and scholarly audience. This account of a scandal in the world of New York psychoanalysis features: K.R. Eissler, a psychoanalyst and head of the Sigmund Freud archives; Jeffrey Moussaieff Masson, a scholar turned psychoanalyst and anti-Freudian; and Peter Swales, a self-taught Freud scholar. Good. B-format paperback. 208 p. Intended for college/higher education audience. Intended for professional and scholarly audience. This account of a scandal in the world of New York psychoanalysis features: K.R. Eissler, a psychoanalyst and head of the Sigmund Freud archives; Jeffrey Moussaieff Masson, a scholar turned psychoanalyst and anti-Freudian; and Peter Swales, a self-taught Freud scholar. An over-the-top drama inside the Freud "castle"
Though under 150 pages in length, In the Freud Archives is so complex that, to serve the potential purchaser of this book, I want to confine my comments to the writer?s craft, that is, to how Janet Malcolm constructed her tale, and to notions such as subtext (what the author does not or cannot say on the surface), and to how her book and its topic of the Sigmund Freud legacy might have changed since the book was first published in 1984. There is clearly a central "character," a protagonist, in this book: Jeffrey Moussaieff Masson. The opening pages of In the Freud Archives recount Masson?s personal charm and dazzling intellect as he begins to appear at psychoanalytic conferences (which lead to his meeting with the most important of the four or five other "characters," Kurt Eissler, the Secretary or head of the Freud Archives). Note that throughout the book, author Malcolm gives more pages to Masson than to anyone else, the final pages of the book are Masson's words, and he is the only person Malcolm shows in the intimacy of his home with his family. Masson seems to be the perfect "main character" because of his internal conflicts (which he makes visible, as Malcolm recounts them). Very quickly, we find out that Masson?s words and actions are uncivil, bad-tempered, and generally destructive of friendships; though other people in the book are also similarly flawed, they seem not to have redeeming qualities. As the narrative progresses, its as though Malcolm realizes that Masson?s situation makes the most compelling narrative and she wanted to record moments which "save" him; in other words, it seems to me that there is little to redeem Eissler, Peter Swales, or Anna Freud, but Malcolm gives Masson some moments of truth. For example, at the end of the book, in Jeff Masson?s home with Denise, there is a bit of dialogue which Malcolm records that shows Masson does let someone (an intimate friend) question him about his manners. And at two points in the book, Malcolm records Masson saying that the results of psychoanalysis (the conclusions drawn by the analyst about the patient) don?t matter as much as how the patient feels about his or her life. Masson asks, "What do you do with something like Auschwitz?" Masson asks this in the context of psychoanalysts' debates on the patient's "reality" versus "fantasy." A great deal of what In the Freud Archives is about has to do with the current value of psychoanalysis, i.e., its efficacy in assisting the patient to recover happiness in life. If Masson was disgusted with psychoanalysts and their work, and this disgust led him to disgust with Freud and his legacy (thus leading to his being fired from the Archives job), then I wish Malcolm had written more about that point of disgust (at which Masson began to turn away). (However, she meant her book to show the relationship of everyone involved as Freud and his legacy mutated in the 1970s.) Clearly, to me, a key turning point in the narrative occurs when Masson says, "The business of analysis is to . . . get to the [patient?s] pain and the sorrow. But they [the analysts] were arguing that there is no such thing as reality--that there is no single Auschwitz. That is the worst thing that analysis has left the world: the notion that there is no reality, that there are only individual experiences of it" (56-57). Be that as it may, or for what it's worth, other people in the book don?t have moments of truth like this; Masson doesn?t look as "bad" in this book as he thought back in 1984. It's unfortunate that he did not see that. Of course, slowly, but surely, In the Freud Archives is becoming fiction; sooner or later all nonfiction does. Simply put, this book is a must read if you, the reader, want to be a student of life and of the era in which we live. Along those lines, it seems that because of the value of "pop psychology" and "self-help" books, the legacy of Freud and his archives are no longer worth fighting over because people in general see little at stake in Freud's interpretations of life or of our interpretations of his private life. For one thing, sexuality and the meaning of it doesn?t bother people the way it did in the first half of the twentieth century. Today, the average person doesn?t spend much time "interpreting" past actions, phobias, fears. If anything, we come to our conclusions about life very quickly, and we move on. Also, we live in the era of Wayne Dyer, Deepak Chopra, Stephen Covey, and Landmark Education, Inc.,of San Francisco; people interested in moving forward in live spend less time "interpreting" the past and more in conscious actions which bring them fulfillment. However, a general idea people might agree on is that Freud and his work came into being (in Europe) because the rising middle-class people had a sense of their own misery in an era of rapid industrial development and technological change. Analysis, or psycho-therapy or therapeutic counseling, or "self-help"--whatever you call it--responds to the basic human desire to have positive change in life--and to be at peace. Given that happiness should be easier to find, it is sad--indeed tragic--that the intelligent people Janet Malcolm writes about should find it not only impossible to get along, but also escalate and perpetrate bad feeling. Another unfortunate situation is the tendency of "experts" like Eissler and Swales and Masson to protect their viewpoint at any cost, to the point of declaring people "wrong," people who as writers and thinkers might have something valuable to say. Malcolm?s book is a chronicle of intellectual history, a tale of that specific time in the 1970s and ?80s when such fights could take place. The copyright on Malcolm?s "Afterword" for the NYRB edition is 1997--now ten years ago. This book has everything that a good mystery has, intrigue, suspense, betrayal, hidden agendas, fascinating players. It has all the elements that you can expect in the story of gullible and greedy people who have sworn to present an air tight story that advances professional interests,in this case, those of the psychoanalytic establishment. But at some point I had to wonder how a person with Malcolm's credentials could burrow so deep into the inner circle of psychoanalysis. And I continue to wonder and have doubts. But those are the elements of a good story. When I found myself really believing Malcolm's yarn, I wished that I were not left with the feeling that I had been forced to take sides in a dispute that matters, but that I really don't fully understand. I read it in one sitting. The next day I mentioned the book over lunch with a friend and found myself in middle of a very heated discussion.